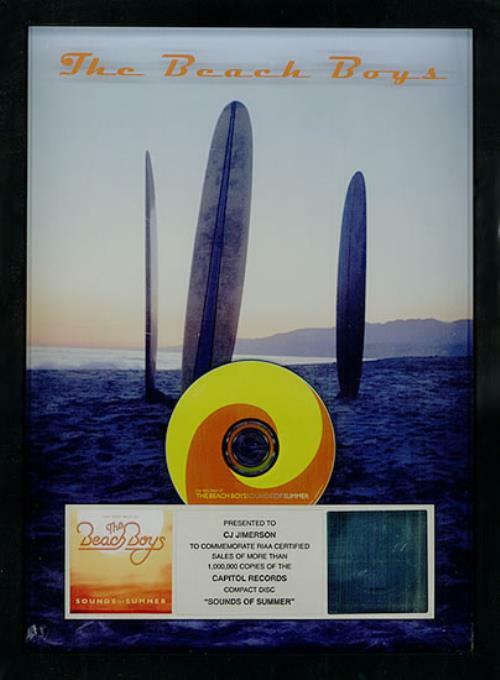 BEACH BOYS Sounds Of Summer (Rare official 2004 US RIAA certified PLATINUM award, issued to commemorate sales in excess of 1,000,000 copies of the Capitol label 'the very best of' CD album, featuring a copy of the CD mounted above the RIAA hologram silver dedication plaque with miniature artwork, set against a full colour 'surfboards' image and covered with clear perspex overprinted with orange band logo to give a 3-D effect. Expertly framed, measuring 18" x 13�" - an amazing item ready to hang on your wall) ** Complete With Certificate Of Authenticity **. or visit our The Beach Boys image gallery.